Werner Herzog’s alter ego is my alter ego. 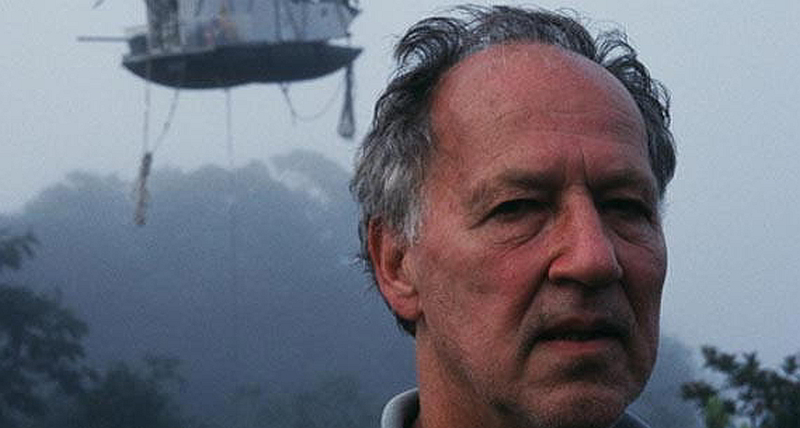 By that I mean Herzog, the character in Herzog’s almost-documentaries, not Herzog in real life. Not the film director who ate his shoe, moved the boat over the mountain or got shot. Or made films. Half-fictional Herzog interrupts the films of Werner Herzog to ask questions, explain what’s happening, or, fairly often, to complain. I can’t remember where I saw him first, because I felt like I already knew the lugubrious German narrator, with his odd sayings and quiet glum background presence. Out of himself, Herzog has invented a character that is distinctive, slightly caricatured and weirdly familiar – like Dickens’s characters. The films often turn on this person’s experience. In The White Diamond (2004), Herzog puts his camera behind a waterfall that is sacred to a local tribe, and sees, but doesn’t show, the footage. In Grizzly Man (2005), Herzog listens to a recording of Timothy Treadwell being mauled by a bear, and the film of his listening – but not the recording itself – makes its way into the last cut. With his deliberate and emphatically bad accent (he always speaks in his second language, English) Herzog is as much an outsider in any of his peculiar scenarios as his subjects. In just a few of his ‘documentary’ films, Herzog looks into the lives of Antarctic geologists, Canadian hermits, Guyanese diamond miners, Himalayan Buddhists, Parisian academics, South American tribal elders. He listens to the people he encounters, properly, if not seriously. The humour doesn’t come from jokes exactly. Herzog’s films are funny because they’re uncomfortable, partly because they appear to be real – it is not quite clear what is natural and what is manufactured; or what we know, and what we think we know. This character is my alter ego because I am interested in the things he is interested in. The narrator in my book has something of Herzog’s awkward background presence. I like how he plays the fool. I admire how he is inept: comically and with bad temper, but necessarily, because he is enthusiastic about exploring things which are always a bit beyond him.